Here are 4 free Windows 8 Instagram client apps that let you access your Instagram account… you can easily like photos, comment on them, or just share your favorite ones with others, from within the apps. For those who do not have any idea about Instagram, then here is the a bit about it… its an online social networking and photo-sharing service where you can upload pictures and share it with others. You can get hundred of likes and comments from your subscribed list as well as from others. Instagram Live is one of the most popular Windows 8 Instagram client apps, that lets all Instagram users and non-Instagram users to view data feeds of all the latest images in Instagram at zero cost. The interesting thing is that you do not need any Instagram authentication or to login to your account, in order to access Instagram Live app. Well.. good for those who do not have any Instagram account. But, in case you have Instagram account, then you can use this app to get all the latest images from the people you are following, save your favorite images to your local machine, share images via SkyDrive and Email (from within the app), and the like. As you open the app, you will find different categories including Popular Images, Popular Tags, Random Images, Images By Location, About, and Login. You need to click on the one to move further. You can easily view latest Instagram Tags, search photos by location, and more. Each image comes with ‘Link to Instagram’ clicking on which will take you to a browser and open the image in the website. Here, you can like a photo, comment on it and get option to subscribe. Go ahead and download Instagram Live app in Windows 8 now. 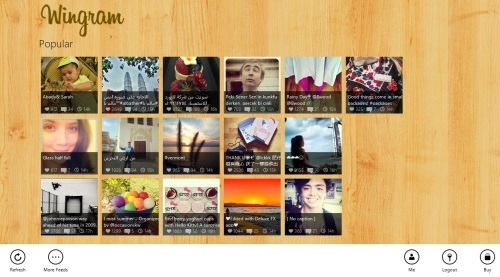 Instametrogram is another powerful Instagram client Windows 8 app that keeps you updated with your Instagram account. You can easily view all the latest photos posted by your subscribed list as well your own. You can like photos, comment on them, and share photos with others, from within the app. Also, the facilitates with options to see where were your Instagram images taken. Yup.. it comes with a map using which the app tracks the location. The interesting thing is that the live tile and notification options keep you up-to-date with all the latest things happening on Instagram. You can also save your favorite images to your local machine, view all your followers along with the images they last posted, people you are following, search for friends or a specific type of images, and much more. The interface of this Windows 8 Instagram client app is beautiful tile-based column one. As you open the app, you will find three different categories: Feed, My Feed, My Likes, My Follows, and Popular. As you click on an image, it will open with the details. Here, you can like the image, comment on it, save it on your local machine, or just share it with others via Email, from within the app. 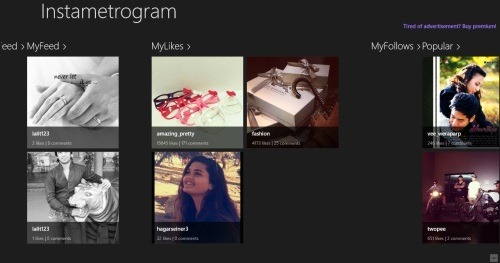 Go ahead and download Instametrogram app in Windows 8 now. 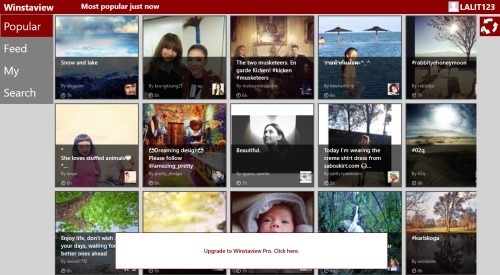 Winstaview is yet another Instagram client app for Windows 8 that lets you browse through all the latest Instagram images. In order to access you Instagram account, you need to login. You can then view your Instagram feed, your own Instagram photos, popular photos, search images by hash-tags and users. Each photo comes with its basic details and you can easily like or comment on each photo, from within the app. It’s very easy and simple to access your Instagram account using Winstaview app. Download Winstaview app in Windows 8 now. WinGram Lite is a free Instagram viewer that brings you latest photo updates right from your Instagram feeds. You can easily view your own Instagram feeds and all popular images, recent images, check out user profile, view people you are following, your followers along with their posts, like photos or comment on them, share images with others, from within the app, save photos to your local machine, and more. In addition, you can also search for specific type of images, look for users, pin to start a user’s profile for regular tracking. Each photo comes with options such as Message, Like, Comment, and Download. Well.. Message option lets you post a message to the respective user, Like option lets you like the image you are currently seeing, Comment lets you comment on that image, and Download option lets you download the currently opened image to your local image. As you scroll towards the right, you will find a list of people who have liked that particular image. The Share Charm lets you share photos with others via Email, from within the app. Go ahead and download WinGram Lite app in Windows 8 now.